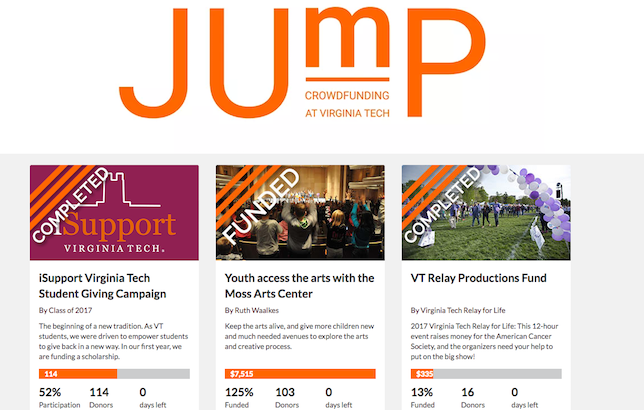 Virginia Tech early last month launched its own crowdfunding platform called Jump, which showcases campus projects in need of financial support. Already, more than 300 donors have contributed more than $21,000 to the four campus initiatives on the platform. The “Youth access with arts with the Moss Arts Center” initiative, for example, has exceeded its original $6,000 fundraising goal by about 125 percent. Since opening the fall of 2013, the Moss Arts Center at Virginia Tech has held “performances, artists residencies in schools, youth gallery exhibitions and other opportunities” to more than 12,000 children, the campaign page states. The funding will be used to provide quality arts experiences for more K–12 students, including a school matinee for performance for more than 1,200 students. “VT Relay Productions Fund,” which has reached 12 percent of its $2,500 goal to sustain the largest collegiate Relay For Life. According to a Virginia Tech statement, the university will add more resources to Jump over the summer — including a toolkit for prospective crowdfunding users.